If I can recommend one thing to do in India with kids it is to go on a camel safari. 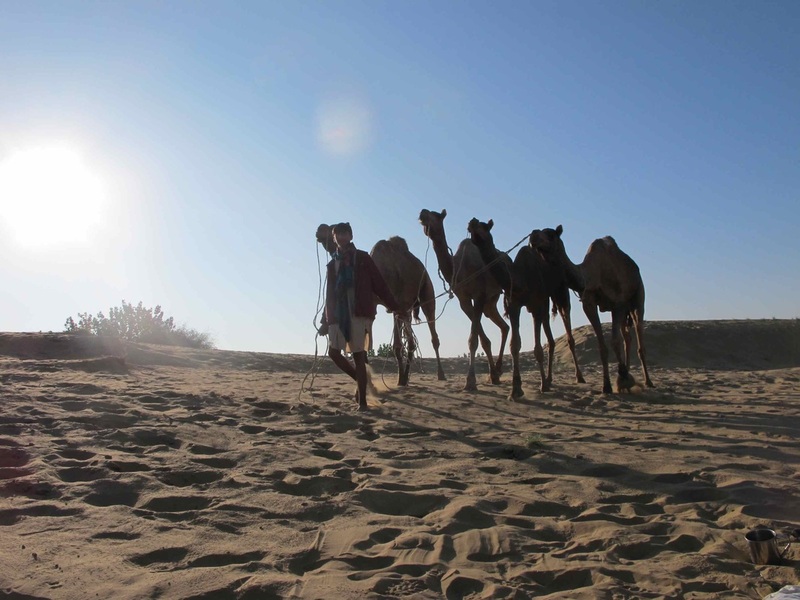 We signed up for one in Jaiselmer with Camel Adventure and it was everything we were promised and more. The five of us headed off on four camels with two guides which meant that everybody doubled up - the girls would switch off riding with Vincent and me and one of the guides rode with David Evan. All of the camels were packed to the gills, we were literally sitting on our bedding but it was very comfy. For three days our small caravan followed an ancient routine that had not changed since the days of the spice trade. Since our movements were set by the sun, we would wake at dawn and, in the cool of the morning, ride for three or four hours, then stop for lunch. The guides prepared this over a campfire, after which we would rest in the shade till around 3 pm thus avoiding the harshest of the day's heat. As the sun lowered, we would get up and ride for another two or three hours to arrive at our spot for the night where we would set up our bundles for sleeping. I think one of the things I most loved during these three days was the daily enforced siesta with no internet connection - we would read, play cards and trade silly word games as well as nap. The real adventure was just the complete isolation. We saw nobody but a few goat and sheep herders who in both their occupation and clothing could have stepped out of the 12th century. At night we would spread our blankets watch the crackling fire and then the stars as we fell asleep and wake up in the morning to the dawn. For the kids, one of the most fun parts was sleeping on the sand dunes. They had a blast playing in the sand, sliding down the hills and even teaching some local kids "American football" by using a melon as the ball. Amazingly, though the desert is mostly scrub land with thorny bushes and scratchy grass, apparently during the two months of monsoon they get enough rain to plant a full harvest of millet, melons and cucumbers. It was a lovely escape from the hustle and bustle of India into pure space and quiet. The gentle sway of the camels and soothing sameness of the landscape lulled one into almost meditative tranquility. Before you think my kids are complete buddhists, we also had iphones so we could listen to music as we rode. But we had plenty of really good chats as well as we rode side by side. In the end, I think that was the most special part of all. 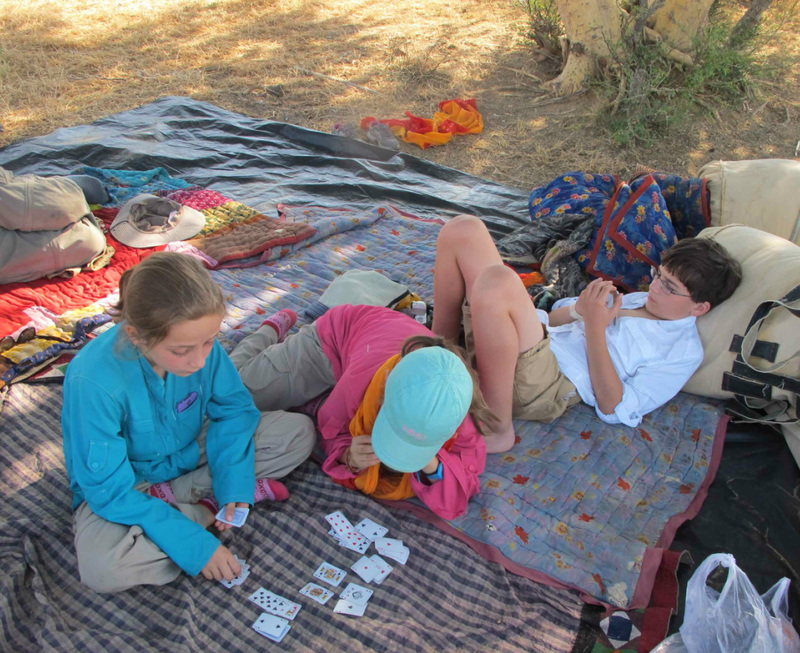 How much longer will my kids be content to be next to me for a whole day wandering through a desert or not?